Mill interior. Photo courtesy Old Mill Museum. Guided tours are offered at the mill. 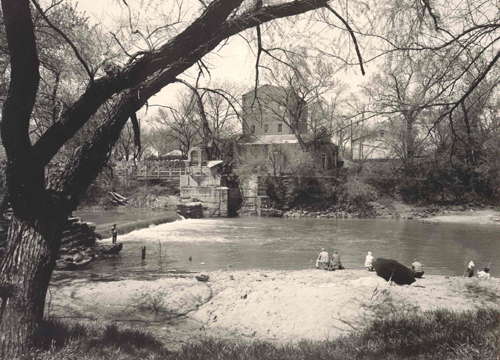 Photo courtesy Old Mill Museum. The Smoky Valley Roller Mill is a finalist for the 8 wonders of Kansas History because it is the oldest operational roller (flour) mill in the Midwest and the only one with all of its original equipment in place. Research has not uncovered another restored mill like it anywhere in the central United States. It is the oldest roller mill still standing in Kansas and the only one with all of its original equipment still in place. It has been not only preserved, but fully restored to operating condition and is capable of producing flour at any time. This mill represents the transition to modern milling (the change from grinding with stones to grinding with corrugated chilled iron rolls) in Kansas and the United States. This transition took place very quickly in our state. The mills in Kansas played a large role in securing Kansas's place as a leading producer of flour as well as wheat. Millers in central Kansas were among the earliest to endorse hard winter wheat flour. This mill reflects the craftsmanship and technologies of the late 19th century that continued into the 20th century. The steps for producing flour have not changed. Today's mills simply use an updated version of the machines in the Smoky Valley Roller Mill. At the time this mill was built, almost 500 mills were in operation across the state. Now there are about a dozen. Few historic mills have survived. The Smoky Valley Roller Mill is a rare exception. The mill is open daily except major holidays. Guided tours are given on request and an audio-tape guide and video are available. The mill operates (without grain) once a year during the museum's Millfest event, the first weekend in May. During that weekend alone, about one thousand people tour the mill to learn how wheat was, and is, made into flour. Professional millers and trained volunteers donate their time to supervise operations and guide tours. The mill has a strong impact on tourism in this area. Between 10 and 15,000 visitors each year visit the site to see the historic mill and learn more about the agricultural heritage of the state and region. A large part of our Kansas heritage revolves around farmers working to produce quality wheat and millers working to produce quality flour. The Smoky Valley Roller Mill illustrates a very important part of that story. OPEN: Monday-Saturday 9 a.m.-5 p.m.; Sunday 1-5 p.m. Closed Thanksgiving, Christmas and New Year's holidays. Admission fee is adults $2; children 6-12 $1. 2010 MILLFEST: Saturday, May 1, 9 a.m.-5 p.m.; Sunday 12-5 p.m. See the 1898 flour mill in operation (must be at least 13 years old to be in the mill when it is operating. Viewing areas are provided for younger children).